And yet, another pasta recipe. You see I have a thing about pasta. I would eat it everyday if I wasn’t thinking too hard about all the carbs I don’t need. After an extra long commute home the other day, I arrived, said my hello’s and headed to the kitchen. I didn’t have a dinner plan whatsoever. Looking through the refrigerator I found a little log of chavrie goat cheese, a little pancetta, a handful of parsley, a shallot and by this time a pasta sauce was formulating in my mind. I thought if I had Parmesan instead of goat cheese I could make Carbonara. Then I remembered I do have some Grana Padano! Realizing I have never made carbonara I took my copy of Marcella Hazen’s Essentials of Classic Italian Cooking off the shelf. Now let just say when I was “with child” spaghetti carbonara was “my dish”. I craved it everyday and dined on it at least once a week for a good six months! And to imagine I have never made carbonara is quite nonsensical. I left it up to the chef at my favorite trattoria. I didn’t even want to try to prepare it because I knew I could never match the quality of La Trattoria’s carbonara. Well…Eureka! Success in the kitchen. Here it is, in my humble opinion, a most delicious carbonara. Of course in the spirit of improv I made a few very minor adjustments to Marcella’s recipe due to not having all of her listed ingredients. In place of the Grana Padana you could use a good quality Parmesan. Place a large pot of water on the stove over high heat. Once your water is at a roaring boil add a tablespoon of coarse grain salt and drop your pasta in. Cook until al dente, spaghetti cooking time is approximately 9 minutes. Drain, reserving 1/4 cup of pasta water. Put the garlic and olive oil in a large sauté pan over medium high heat. Sauté until the garlic is golden. Remove and discard garlic. Add the pancetta to the pan and cook until crispy, then add the shallot. Continue to cook until shallots are soft and turn off the heat. Using a fork lightly beat two eggs in a medium size bowl. Add 1/2 cup grated Grana Padano, a grinding of black pepper and the chopped parsley. Once the spaghetti is cooked, slowly drizzle in reserved pasta water until smooth. Mix thoroughly, using something like these! Briefly reheat the pancetta over medium high heat, turn off the pan and add spaghetti, toss to combine well. Add the egg mixture and continue to toss to combine and allow the egg to set without scrambling. Serve right away with freshly grated Grana Padano cheese. Thank you so much. Those “claws” are so useful. You are not alone, I love carbonara but never make it myself. I love ordering it at the restaurant. I will have to change that, it’s one of indulgent favorites. Great recipe, thanks for posting. I also go to Hazan often for inspiration and just plain good Italian food. Loving your pasta recipes! and you know, like yourself, spaghetti carbonara has always been one of my comfort foods – when I feel down, under-the-weather and have a sore throat, i turn to carbonara! So glad that I can now make it at home instead of only eating it at Trattorias!! thanks for sharing the recipe dear! Have a great week! Thank you Felicia! Thank goodness I forget about carbonara now because 15 years ago I sure had my share of it! ;) I love it! Oh, one can never have enough good pasta recipes! And carbonara? A super classic favorite. Honestly, you cannot ever go wrong with anything with pancetta in it =) Thank you so much for sharing this delectable recipe; the pic made me hungry! xo! I agree! I would definitely eat it every day. This recipe is one of my particular favorites! 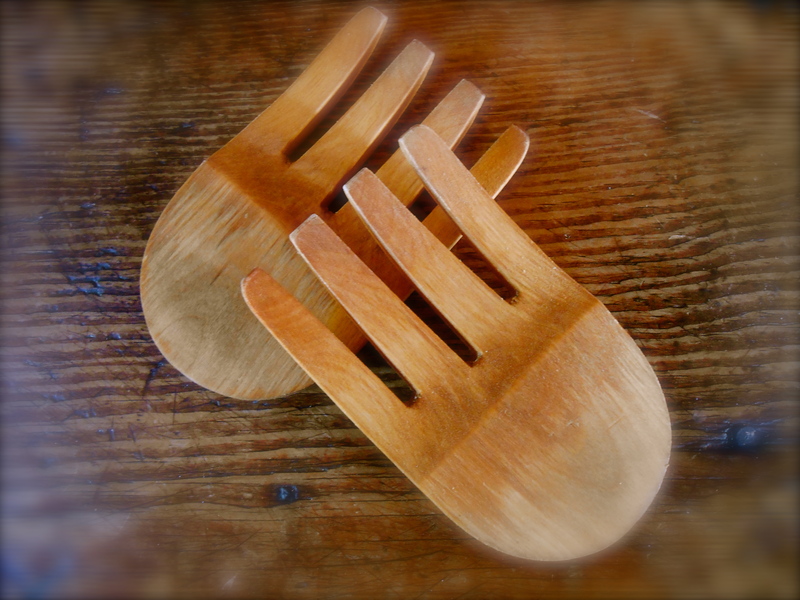 Btw,where dis you found that fancy wood fork?? I love carbonara! Anything with pancetta gets a thumbs up in my book! Looks delish. I never grow tired of carbonara! And always fun to try someone else’s twist on it. You are cut from the same cloth as my Zia and I. We, too, could eat pasta every day and never complain. Carbonara is a favorite, too. Your recipe sounds delicious! I do love the carbonara, such a simple dish with maximum taste. Looks wonderful. you can never show us too many pasta dishes! I’ve just added pancetta to the grocery list. I have a weakness for pasta–this sounds so good! Oh, my daughters and I have a thing about pasta too! We just can’t get enough… Beautiful pasta dish! 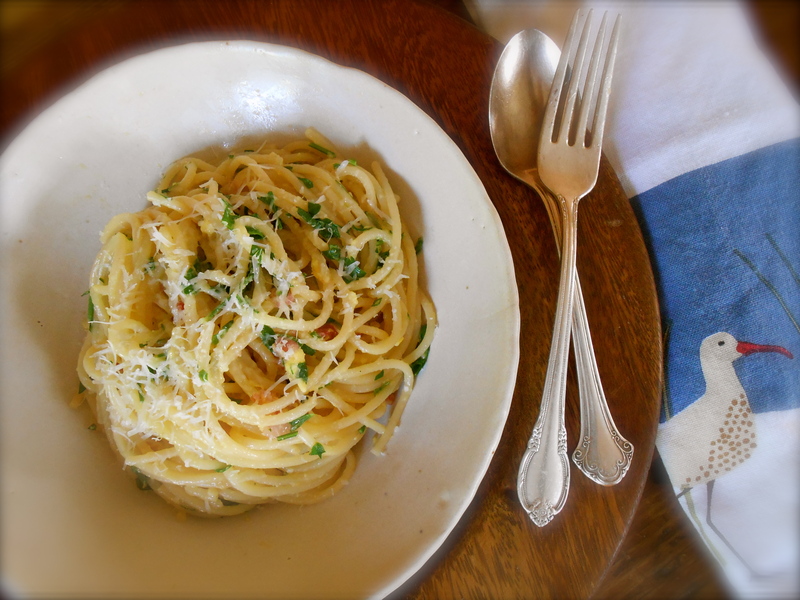 You are currently reading spaghetti carbonara at COTTAGE GROVE HOUSE.